Hick’s Law states that the more choices we face, the harder it is for us to make a selection. Perhaps best explained in the terrific book The Paradox of Choice by Barry Schwartz, Hick’s Law is why you stand slack-jawed when trying to make a cereal selection at Kroger: too. many. kinds. of. cereal. Increasingly, we try to shortcut our decision-making by relying upon aggregate opinions of other people who have already experienced the thing we seek. Psychologically, this is what powers ratings and reviews sites like Yelp, TripAdvisor, ApartmentRatings.com, RealSelf.com (plastic surgery reviews), and the hundreds of other sites that collect opinions and present them with one- to five-star scores. The companion trend giving rise to these sites is our relative distrust of messaging from companies and organizations and our comparative embrace of the feelings of our fellow humans. Oft-cited research from BrightLocal says that more than 80 percent of people believe at least some online reviews as much as they trust recommendations from friends and family members. Companies, on the other hand, are trusted about half the time. I suspect our reliance on ratings and reviews will continue to escalate. After all, who has time to figure out the best whatever in your area? Just compare their average ratings, and make a decision that way. A fascinating sidebar of the rise of ratings and reviews, however, is the application of similar data collection to employers. Glassdoor.com and Indeed.com are the leaders in the fast-growth category of employer reviews. Both firms use these ratings as a robust content marketing initiative that spurs awareness and interest in their recruitment and job placement services. Both sites are red hot. Website traffic places Glassdoor as the 202nd busiest site in the USA and Indeed at number 27, according to SimilarWeb data. Further, more and more companies (including consulting clients of ours here at Convince & Convert) are increasingly interested in how they are portrayed on these sites. Why? The current labor market is almost historically tight, with job seekers holding the cards in ways they have not for many years. If you’re looking for a job in retail, or hospitality, or insurance, or healthcare, or homebuilding, or anything else, and you have multiple options, why would you NOT compare your potential employers on sites like these to see what current/former employees have to say about the policies, culture, and environment? Thus, sites like Yelp and TripAdvisor provide a snapshot of how well companies are meeting customer expectations, while sites like Glassdoor and Indeed offer a similar glimpse into alignment with employee expectations. It is a long-held maxim that companies that deliver a good customer experience typically also provide a good employee experience. This correlation is not an accident, as it often speaks to underlying culture and values. 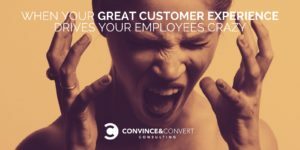 In fact, many researchers believe that one begets the other; treating your employees well naturally manifests in improved customer experiences. Just to cherry-pick some examples, leaders in customer experience like Southwest, Ritz-Carlton, and USAA are generally known to be good places to work. But sometimes, what customers want and what employees prefer veer in opposite directions, like magnets with opposing polarity, or the Gallagher brothers at a family gathering. A new research project from Brain+Trust Insights demonstrates how this can happen, this time at Olive Garden Restaurants. Brain+Trust Insights is a new consultancy that uses big data and machine learning to uncover interesting and applicable truths about brands and behaviors. The firm is led by my brilliant friend Christopher S. Penn, who is unquestionably the most interesting person I know. 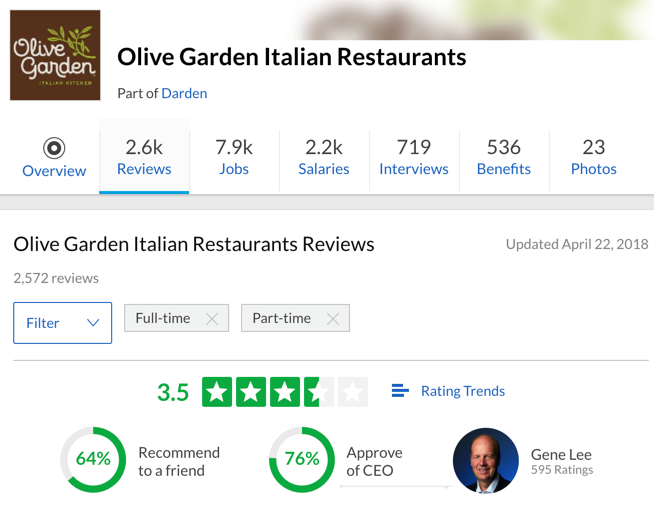 For this project, Chris and his team digitally ingested (using IBM Watson Analytics) 2,547 Glassdoor reviews of Olive Garden, the prominent, 844-location Italian food restaurant chain owned by the Darden Restaurants group. Across all reviews, the company has an average score of 3.5 out of 5, as of April 2018. 64 percent of workers would recommend the company to a friend, and 76 percent approve of the company CEO. These numbers are pretty solid for a national restaurant chain. In comparison, Outback Steakhouse and The Cheesecake Factory average 3.6, and Chili’s maintains a 3.4 rating. Happier employees provide better service, improving customer retention and profit. Employee churn is a colossal expense for all restaurants, costing millions of dollars in training costs for a chain as large as Olive Garden and reducing the on-floor experience and expertise of the staff due to turnover. In a tight labor market, remaining fully staffed may be easier if Olive Garden could meaningfully creep ahead of competitors in average Glassdoor score. It’s worth it to move from relative contentment to genuine happiness within the employee ranks at Olive Garden. And the analysis by Brain+Trust Insights shows that this is actually occurring already. Negative comments and low review scores among employees have dipped consistently since 2014. But more can and should be done. How? Change the free breadsticks policy. 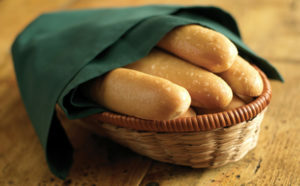 You may know that a signature Olive Garden experience is breadsticks delivered to your table once you’re seated. And one of the most popular menu items is the $11.99 unlimited soup, salad, and breadsticks combination. Restaurant patrons love the breadsticks. Many employees loathe it, and the data shows this to be true, as many team members leaving Glassdoor reviews specifically mention that the breadsticks, in particular, set them up to fail because they are either constantly having to re-fill the breadsticks basket, or because the breadsticks are decidedly less tasty when they sit for a few minutes. Operationally, Olive Garden has to balance the rampant, almost cultish popularity of the soup/salad/breadsticks combination—which spurs nearly 80 percent of all social chatter about the brand, according to Penn—and the companion fact that the very thing customers love is also driving dissatisfaction among team members. This is a classic game theory quandary. What does it require to recruit new customers consistently if you do NOT have the breadsticks offer, and how does that compare with the costs and impacts of a partially dissatisfied workforce? There are two lessons here. First, in our heightened zeal to provide better customer experiences (usually a good thing), we may trigger unintended consequences. And second, the application of machine learning to peer into previously opaque data sets and derive insights is useful and interesting in many contexts. I guess there’s no such thing as a free lunch, even if it’s just breadsticks. Download the entire report from Brain+Trust Insights here.